The USB Filter Editor is a Windows tool used to configure the usbfilter.txt policy file. The policy rules defined in this file allow or deny automatic pass-through of specific USB devices from client machines to virtual machines managed using the Red Hat Virtualization Manager. The policy file resides on the Red Hat Virtualization Manager in the following location: /etc/ovirt-engine/usbfilter.txt Changes to USB filter policies do not take effect unless the ovirt-engine service on the Red Hat Virtualization Manager server is restarted. Download the USBFilterEditor.msi file from the Content Delivery Network: https://rhn.redhat.com/rhn/software/channel/downloads/Download.do?cid=20703. Use a Secure Copy (SCP) client to import and export filter policies from the Red Hat Virtualization Manager. A Secure Copy tool for Windows machines is WinSCP (http://winscp.net). Type of USB device; for example, printers, mass storage controllers. The manufacturer of the selected type of device. The specific USB device model. The revision of the product. Allow or block the specified device. The USB device policy rules are processed in their listed order. Use the Up and Down buttons to move rules higher or lower in the list. The universal Block rule needs to remain as the lowest entry to ensure all USB devices are denied unless explicitly allowed in the USB Filter Editor. 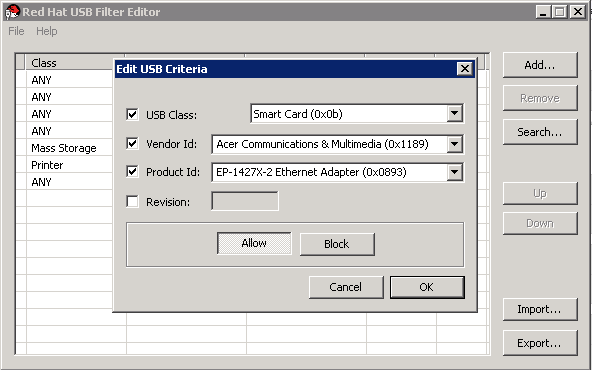 You have added a USB policy to the USB Filter Editor. USB filter policies must be exported to the Red Hat Virtualization Manager to take effect. You have removed a USB policy from the USB Filter Editor. USB filter policies must be exported to the Red Hat Virtualization Manager to take effect. You have searched the attached USB devices. USB filter policies need to be exported to the Red Hat Virtualization Manager to take effect. USB device policy changes need to be exported and uploaded to the Red Hat Virtualization Manager for the updated policy to take effect. Upload the policy and restart the ovirt-engine service. As the root user on the server running Red Hat Virtualization Manager, restart the ovirt-engine service.